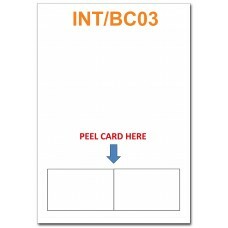 Integrated business cards combine a peel out card with an A4 sheet of paper. The sheets can be printed on a standard laser printer and will overprint both the card and the paper at the same time. The cards are the same size as a standard business card and can be used for that purpose, or as a membership or loyalty card. We offer integrated business cards with premium quality and durability. 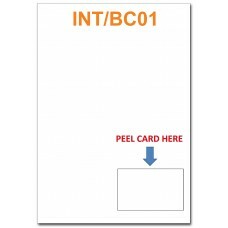 They are great for marketing purposes as the main body of the form can be used as a sales brochure or promotional form with information for the customer, and then the integrated business card can be removed to keep personally in your wallet for use when needed. The integrated business cards can also be used as membership cards or concession cards. 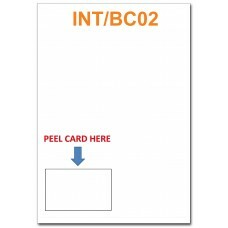 All information can be printed on one sheet, rather than having to print separate administrative flyers and then have separate membership cards printed. They reduce time, labour and cost. And because they are being printed in one pass, the colours and data will match every time. No more different shades of your logo on your marketing material! It also reduces human error by guaranteeing that the right card is sent with the right literature to the correct person!